A US soldier from 1st Platoon Bravo Troop of 1st Squadron, 71st Cavalry walks past Afghans on a three-wheeler vehicle during a patrol in the Dand district of Kandahar Province in Afghanistan. An extensive ground and air search was underway Sunday for two American soldiers who went missing in Taliban territory in Afghanistan, military officials said, amid fears one of them had been killed. Nothing had been heard of the two, an official from NATO's International Security Assistance Force (ISAF) told AFP. "They are still missing, we have had no contact with anybody so far, so we cannot confirm what has happened to them," the official, who asked not to be indentified, told AFP. "There is no confirmation that they are dead or have been kidnapped," he said, adding: "There are rumours that one of them is dead." Another ISAF official, also speaking on condition of anonymity, said earlier there were reports one of the pair had been killed and his body removed from the scene, in eastern Logar province where Taliban have a solid presence. US media reports suggested the two may have left their base, in Charkh district, without permission. They had been missing since about 8 pm (1530 GMT) on Friday and their car had been recovered in an area it should not have been, the officials said. Local radio stations in Logar, south of Kabul, broadcast descriptions of the pair and offered rewards of ten thousand dollars for information leading to the safe recovery of each man, an AFP correspondent in the province said. An ISAF statement issued almost 24 hours after the pair disappeared said they had left their compound late Friday "and did not return". "Nobody has been found but there are reports that there may be a casualty and that the body has been removed from the scene," one of the ISAF officials said. All reports were unsubstantiated, he added. A Taliban spokesman denied the insurgents were behind the disappearance of the soldiers, though earlier he had contacted media outlets with detailed descriptions of the soldiers and the equipment they were carrying. Speaking to AFP by telephone from an undisclosed location, the Taliban's eastern Afghanistan spokesman, Zabihullah Mujahid, said: "So far, we are not aware of it and cannot confirm this". A spokesman for Logar's provincial governor said the two soldiers left their base in Charkh district late Friday "and went to opposition territory". "One of them has been killed and the other has been detained by the opposition," Din Mohammad Darwaish told AFP, referring to the Taliban. The BBC quoted Darwaish as saying the pair had been warned not to venture into what was known Taliban territory, and had found themselves in a gun battle with insurgents, after which they were captured. Kidnappings of foreign soldiers are rare in Afghanistan, where a nine-year insurgency has been escalating in recent months, particularly in the southern provinces of Helmand and Kandahar. Most kidnappings in recent years have been by criminals for ransom, though targets identified as high value have in the past been sold on to insurgent groups, who then use them as political pawns. A 24-year-old US soldier, Bowe Bergdahl, who disappeared on June 30, 2009 is believed to have been the first American snatched by militants in Afghanistan. Bergdahl's captors have released at least two videos showing him to be alive, most recently in April. The Taliban warned earlier this year they would target foreign military and government installations and staff, as well as Afghans working for them or for the Kabul government. NATO said four US soldiers were killed by a bomb in southern Afghanistan on Saturday while a fifth American died in a later attack. Both attacks involved improvised-explosive devices, or IEDs, the main weapon deployed by the Taliban in their insurgency. The deaths bring to 397 the toll of foreign soldiers killed in the war so far this year, compared with 520 for all of 2009. An AFP tally based on that kept by the icasualties.org website puts the number of soldiers to have died since the Afghan insurgency began in 2001 at 1,965, with 1,205 of them Americans. 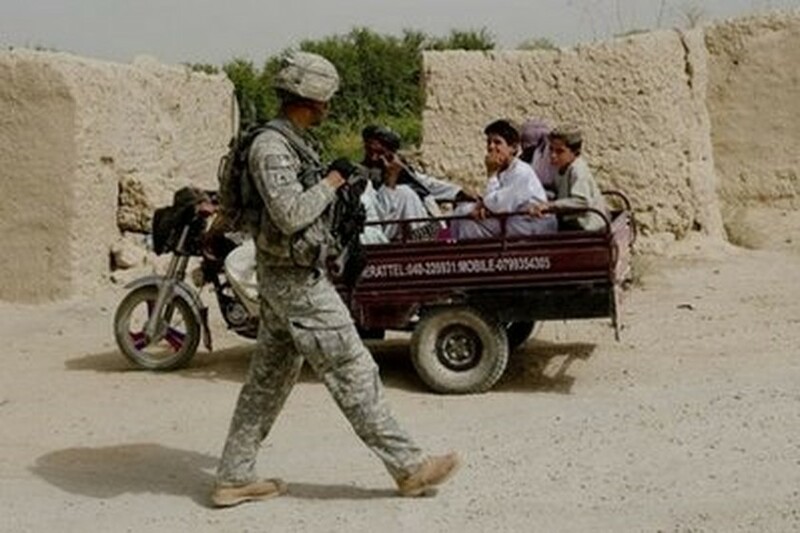 The US and NATO have almost 150,000 troops in Afghanistan, with the surge of an extra 30,000 Americans ordered by US President Barack Obama almost fully deployed, most of them in the hotspots of Kandahar and Helmand.